For someone who has never flown a plane, Anita Verna Crofts has guided a lot of people in their quest for flight. How can someone who herself has never flown a plane be a flight instructor? 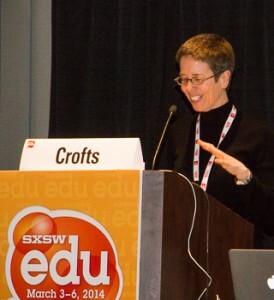 “I teach people to take off with their ideas,” said Crofts during her talk here today in Austin during the final day of the SXSW Edu conference. Her five-class series, “Leadership through Story and Communities: Creativity and the Digital Age” (COMM 536) is a core requirement for graduate students in the UW’s Communication Leadership program this winter quarter. The full-day Saturday classes are modelled on an executive training framework, she added, but there are important differences. It’s about creating a space – both physically and mentally – that facilitates the community and the creativity that it takes for students to exceed expectations, said Crofts. Community is an underlying thread that runs through every facet of the class, Crofts told the audience this morning. Creating community includes such details as the media-friendly room where the day-long classes unfold: the layout of the space, the technology wired into the stations in the room, and the type and orientation of the furniture. Students face each other across round tables that encourage discussion and de-emphasize the presence of the instructor as a constant focus of attention. They are able to share visuals directly from their laptops on to the central screens that are mounted on every group table, allowing them to share ideas and examples as well as to view the instructor-led material. Tables are also equipped with microphones so that even a large group can easily hear across the room. Food is a core ingredient of the community-building process, Crofts said. Several of the guest speakers supply lunch, and many of these foods represent international culinary traditions. Students, for example, encouraged one speaker to open a Burmese restaurant after that cuisine comprised one of the class lunches. Crofts herself is a devotee of pie, which she bakes for friends and colleagues. “I’ve been a food blogger [and pie maker] for years, so using food to build community is natural for me,” she said. Students also contribute to a class playlist and their selections are played at key times of the day. Crofts finds that music is both a way to share inspiration and to connect. 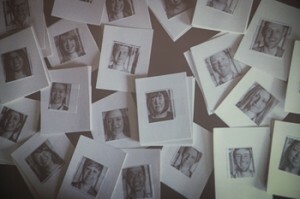 Crofts made flashcards of their photos to memorize every student’s name – all 70 plus – before the first class. “They put a lot into this,” she said, adding that she feels that she needs to model the same community commitment that she asks of them. It’s all part of the Communications Department’s philosophy of empowering students through responsibility, explained Crofts. “When you let students lead, they will take you to amazing places,” she said. 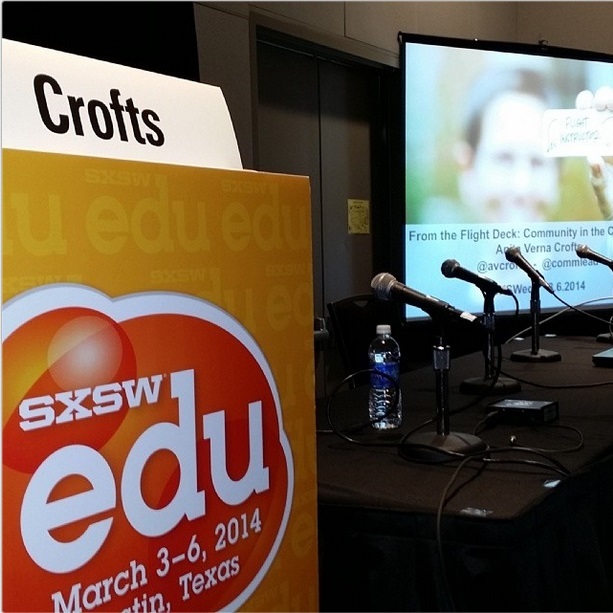 Crofts related the story of a student who politely declined to lead off in a class exercise of sharing the inspiration behind why they’d chosen the songs they’d suggested for the playlist. When asked if she’d like to be the first to share her inspiration, the student’s answer came quickly – “No.” The discussion quickly moved on to the next student. After class, the student who hadn’t been comfortable speaking in class approached Crofts to say that she hoped she hadn’t been rude, and wanted to explain why she had chosen not to speak. English is not her first language, and she felt that her speech was too slow. She worried that she would be seen by the class to be at disadvantage, verbally. “I was glad that she wasn’t just going to capitulate and do what I wanted,” said Crofts. The incident opened a deeper connection between the student and the teacher, and the rest of the class. The student gained confidence. In another example, Crofts described the final projects that students are presenting this Saturday – a map of social connections illustrated with statistically-proportioned cups of colored liquid on a diagram, presented in a time-lapse film, and a one-woman cello/social media/interactive show on multi-tasking. Most movingly, one student is assembling a collection of reflections on vulnerability from members of her class and her community. She kicked off the project in a recent class by sharing with her classmates her own story of love and loss, and how it led her to the Communications Leadership program. The digitally connected class showed overwhelming appreciation and support over Twitter. Heady stuff, with much more to be presented this Saturday, said Crofts, who leaves today to guide her students’ final flight of the series. One of them is having a birthday on the day of final presentations, and Crofts has pie to make.